Start folding origami paper today! With this book, beginning folders will learn the ancient art of Origami. Start folding origami paper today. The Bokashi Harmony paper pack teaches beginner folders how to practice the ancient art of Origami. 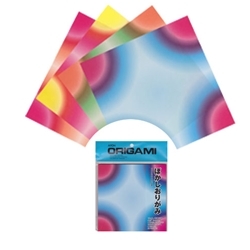 This kit includes 4 mesmerizing Origami Prints as well as basic folding instructions. While the instructions in the kit are geared for beginners, the bright and fascinating patterns add pop to any expert's project as well. All 55 of the Origami Papers in this pack are 6".